This book is gorgeous! Love the artwork and the different doors and windows you can peep through on each page. My daughter and I loved it! A beautiful addition to any collection for both girls and boys. 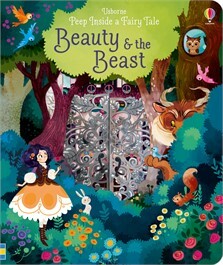 A gorgeous board book retelling the classic tale of Beauty and the Beast for younger children. Usborne’s Peep Inside series has become a firm favourite with pre-schoolers and this exciting interactive book offers a beautifully illustrated retelling of the classic fairy tale Beauty and the Beast... Lorena Alvarez’s busy, bold and atmospheric illustrations bring the story gloriously to life and the appealing cut-outs offer discussion, fun and the magic of discovery on every page.